Visitors to Gardens by the Bay now have more attractions to check out, with the launch of a new area that houses a floral exhibit and cafe, as well as community spaces that will host a weekend market. 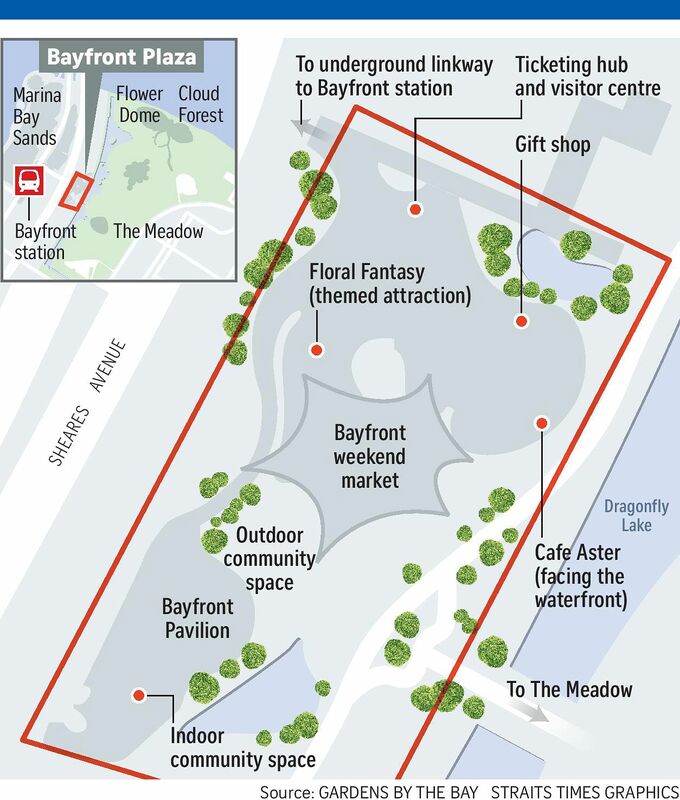 Bayfront Plaza, a 5,000 sq m space located next to Bayfront MRT station, was launched yesterday as part of efforts to expand the Gardens' non-ticketed spaces and line-up of events and programmes for locals. For a year-long period from June, members of the Pioneer and Merdeka generations, comprising Singaporeans who are now in their 60s and 70s or older, will enjoy free admission to the Flower Dome on the second Tuesday of every month. More free events are in store this year, including a Toy Story-inspired light and sound show in June and performances such as a National Day weekend concert in August. Floral Fantasy, a 1,500 sq m ticketed attraction, features more than 3,000 plants across four garden landscapes, as well as a 4D multi-sensory ride called Flight of the Dragonfly. A 2,000 sq m space that includes indoor events space Bayfront Pavilion will be made available rent-free for events by community organisations, as part of efforts to keep the Gardens inclusive, National Development Minister Lawrence Wong said at the launch. The plaza sits on the site previously occupied by the Future Of Us exhibition that was part of SG50 celebrations in 2015, and the lattice structure has been integrated into the area's design. Kicking off on Friday will be a weekend market featuring 30 stalls, a third of which will be run by social enterprises. A public green space for both seniors and the young called Active Garden will also be ready by early next year, said Mr Wong. More will be done to ensure Singaporeans have access to the Gardens, which has received more than 50 million visitors since it opened in 2012. President Halimah Yacob will be the patron of Gardens by the Bay's community outreach initiative Gift of the Gardens, which provides free admission to the conservatories for vulnerable and lower-income groups. About 90,000 Singaporeans have benefited from this programme, which will now be expanded to the Pioneer and Merdeka generations, said Mr Wong. Gardens by the Bay chief executive Felix Loh said visitorship has grown by about 1.5 million every year, with movies such as Crazy Rich Asians helping to cement its status as a world-class attraction. "But, unfortunately, a lot of people still associate Gardens by the Bay with our Supertrees and the two domes alone," he told reporters on the sidelines of the event. While many of the main activities are concentrated in those areas, there is much more to see in the Gardens, added Mr Loh, who noted that 95 per cent of its 54ha in the main Bay South area does not require a ticket for entry. On the addition of community spaces to Bayfront Plaza, he noted that about 70 per cent of visitors to the Gardens arrive via the nearby Bayfront MRT station. There will also be activities and programmes to draw more Singaporeans, who made up about half of the 12 million visitors last year. Residents enjoy discounted pricing to ticketed attractions at Gardens by the Bay, which also plans to pull in the crowd at night. For example, the Floral Fantasy garden will be lit up, and operating hours may be extended from 9pm to 10pm if there is sufficient visitorship in the evenings, said Mr Loh. "At the end of the day, this is the people's garden... We want to make sure this is not just a place that only the wealthy or privileged can visit," he added.